There are two types of people in the world: those who don't know or who don't care for Joni and those who have fallen madly, deeply in love with her. Forever. It is, of course, an unrequited love. The latter know it to be so and yet it does not diminish their feelings, nor does it drain the well of ardour. Her surname is unnecessary to them. There is only one Joni. For the rest, whom the latter pity, her name is Joni Mitchell. The novelist Zadie Smith wrote a piece in The New Yorker in 2012 of her reluctant falling into Mitchell's music. She described her transformation from no interest to epiphany as an "attunement". It's an apposite term, in imagery and in the process of creation and absorption. The art goes out - waves of sound - and finds in others a resonance. Mitchell's music is also a particular type of synesthesia. She paints on a canvas of emotion and intelligence, and people hear it. The singer-songwriter, composer, arranger, poet is one of a kind. No artist in contemporary music of the past 50 years, and quite possibly few in any time, has travelled such expanses of different musical landscapes (folk, pop, rock, jazz), and then reshaped the contours. It is panoramic in scale, limitless in horizon. And that voice, for so long a soaring beauty that hovered near the angels in the upper registers before dipping away, lest it lose itself was an entrancement. It's lowered now through decades of ageing and smoking. On March 23, 1988, Mitchell released Chalk Mark in a Rain Storm. The road on which she was travelling to reach this date had taken her far from her acoustic beginnings. Looking back, it was the midpoint of her career. Twenty years previously, her debut album Song to a Seagull was released; and in 2007, she released Shine. 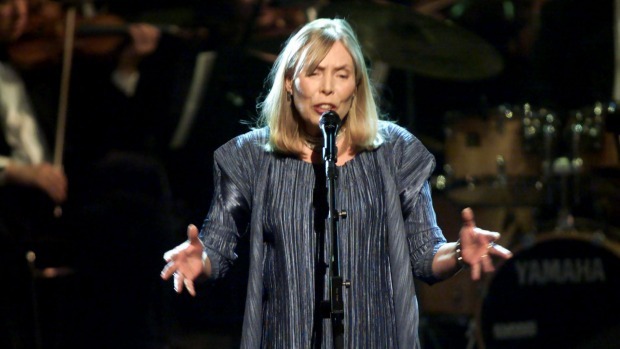 Since then, nothing new, though there has been talk of "Joni writing again". This particular road had begun with Wild Things Run Fast in 1982. Then followed Dog Eat Dog (1985), Night Ride Home (1991), Turbulent Indigo (1994) and Taming the Tiger (1998). Chalk Mark in a Rain Storm, or indeed any of this period are not regarded as top-shelf Mitchell in the way in which Blue is, nor that album's attendant courtiers, Ladies of the Canyon, For the Roses, Court and Spark or a few years later Hejira, yet this period lasted 16 years - a third of her creative time. "Your destiny is a mystery to us. What will happen when the buffalo are all slaughtered? The wild horses tamed? What will happen when the secret corners of the forest are heavy with the scent of many men and the view of the ripe hills is blotted by talking wires. Where will the thicket be? Gone! Where will the eagle be? Gone! And what will happen when we say goodbye to the swift pony and hunt? The end of living and the beginning of survival." Of these albums, Mitchell has said they were part of her best work (indeed Turbulent Indigo won a Grammy for Pop album of the year, - a bizarre irony), but had not "gone into the culture. I wanted to be a voice in there. I wanted to participate but the songs had been deemed sophomoric and negative". She called Dog Eat Dog her "political awakening". One song, The Three Great Stimulants, (artifice, brutality and innocence) harkens to philosopher Friedrich Nietzsche, a Mitchell soul companion. It excoriates Western society and the aims of its inhabitants. It is a theme that has run through her work since Big Yellow Taxi's cri de coeur at mankind's ruination of the environment. Chalk Mark in a Rain Storm came midway through a musical exploration that put her at cross purposes to her acoustic and jazz routes. It wasn't so much a crossroads as a different path. By working with Thomas Dolby a more synthesised atmospheric layering of sound and programming emerged. Chalk Mark in a Rain Storm also included an unusually, for Mitchell, wide and varied guest list including Tom Petty, Billy Idol, Peter Gabriel, Willie Nelson, Don Henley, Wayne Shorter and Michael Landau. There are several standout tracks: Lakota, The Tea Leaf Prophecy and The Beat of Black Wings. In the recent book Joni Mitchell In Her Own Words - which is a series of interviews with writer and singer Malka Marom, Mitchell says: "There's a lot of Nietzsche in my songs. I think what I have in common with him is you can keep your religions as long as you know that it's allegory. "The main thing I took from Nietzsche is a support ... he's describing how Germany decayed. And I take that thought and I show how America is decaying." She laments "the shortsighted stupidity of my species. Our whole lifestyle is carcinogenic." So, too, the music business. Such was its tumorous growth, she would never return. It was, in another analogy, a "corrupt cesspool". Return though she did, with the 2007 release of Shine on Starbucks Hear Music. It made it to No.14 on the Billboard charts - her most popular release in 30 years; the instrumental One Week Last Summer won a Grammy. The release of the album is all the more remarkable given Mitchell's other battle for survival, one that has been debilitating. Morgellons syndrome gives the effect to sufferers of insects crawling under the skin. "At the height of my illness I could not even wear clothing," she has said. "All the time it felt like I was being eaten alive by parasites living under my skin. I couldn't leave my house for several years. Sometimes it got so bad I couldn't walk and I'd have to crawl across the floor. My legs would cramp up, just like I was having a polio spasm." The April issue of Uncut magazine features as its lead 30 artists surveyed for their favourite Mitchell song. The artists range from David Crosby, of course, to Robert Plant (Amelia), Nick Mason, Robben Ford, Al Stewart, Laura Marling, Jimmy Webb and Roger McGuinn. There is, as they say, a lot of love in the room. A lifetime ago, in a small school in Canada, Australian-born teacher Arthur Kratzmann urged a young Joan Anderson to write in her "own blood". Kratzmann was borrowing from a philosopher he was reading at the time: Nietzsche. On the back of her first album, Mitchell made a dedication to Kratzmann, "who taught me to love words". After Chalk Mark in a Rain Storm, 20 years ago, there have been resculpted versions of her songs, some gloriously so orchestrally (the latest being Love Has Many Faces, a four-CD box set), but there have been only four albums of new material. Mitchell turns 72 this year. There comes a time when the clock starts to run against the creative flow. In the book of interviews, Mitchell sees herself thus: "I consider myself like a salmon. Does a salmon consider himself a South American or an American. I feel that these are artificially imposed categories. I feel an affinity to the crocuses coming out of the ground." This goes to a leitmotif of her career, the going back to the garden, physically and spiritually, to mean more in life than a chalk mark in a rain storm. This article has been viewed 2,584 times since being added on March 20, 2015.